While descending Rohtang La, I was thinking which is better - the journey or the destination. When you travel to a place, a significant portion of your time is consumed in the journey itself. True, we search for beautiful viewpoints and sceneries or places of historical importance but I think that the journey is where we get more experiences and destination is what we remember more. This theory derives from the description of two selves as presented in Nobel laureate Daniel Kahneman's Thinking Fast and Slow. More about those two selfs in the sixth part of this series of travel memoirs on Spiti Valley. In the journey, we see all things changing - the river, the roads, vehicles, the landscape and then we can correlate all those things with the life that we live. The equilibrium with the surroundings never sets on while traveling, but at a destination, the ambiance, and your thoughts are in a dynamic equilibrium. Not to take away the credit from a person who sees a landscape and can think something creative on that, while traveling, the mind wanders on too many things induced by the changing terrain. 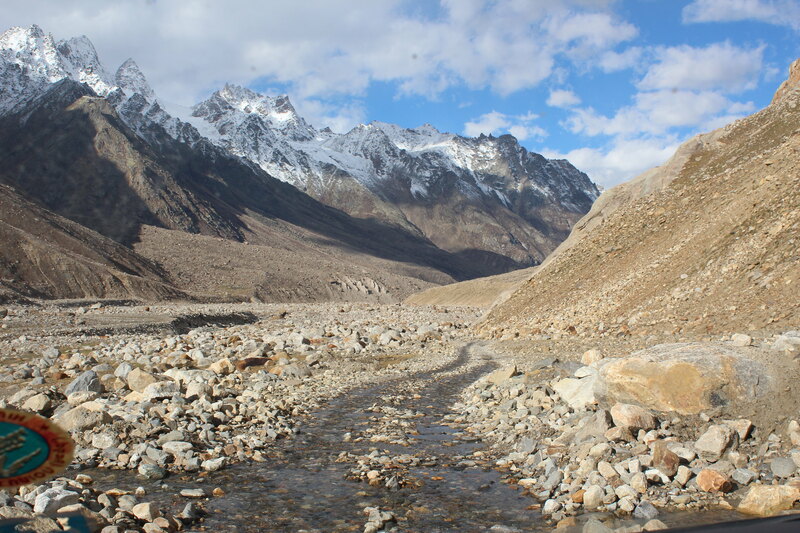 Henceforth our journey was in a valley where Chandra river, an upper tributary of Chenab river, flowed although Chandra river and we were moving in opposite directions. Till Kunzum Pass, we traveled in Chandra Valley. 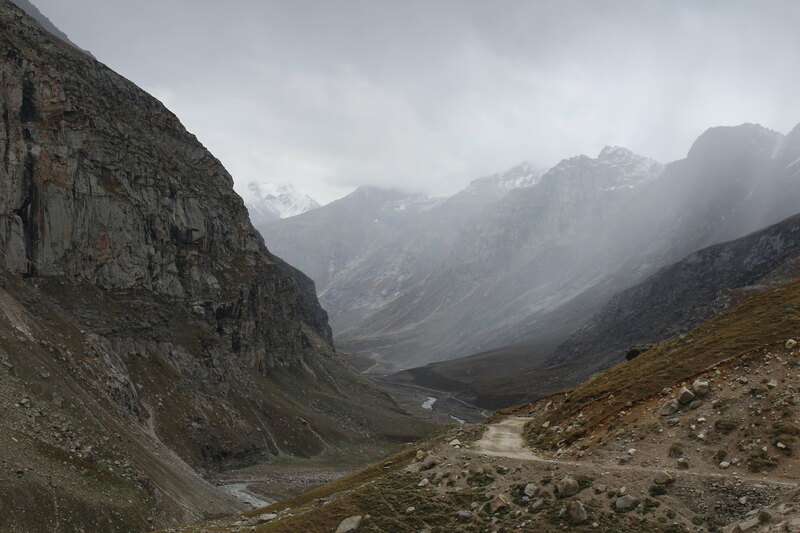 On a cloudy day, the view from Chandra Valley while looking towards Kunzum Pass was breathtaking. As described in previous part the coming and going of clouds and getting glimpses of sunlight in between was enthralling. Not to frighten someone, but such a weather resembles what was shown as Mordor's weather if you are a fan of 'Lord of the Rings' series. Black clouds hovering over high mountains. There was some construction activity going on that road and because of that many bulldozers and earthmoving machinery was present there. We had to stop many times before that array of heavy equipment could make way for vehicles to move on. When enquired we got to know that they were laying optical fiber cables (OFC) to bring connectivity to one of the remotest regions of the India. The conditions of roads till Kunzum Pass deserves a mention. While the initial stretch of the road was good, roughly till Chhatru, road after that was very bad. 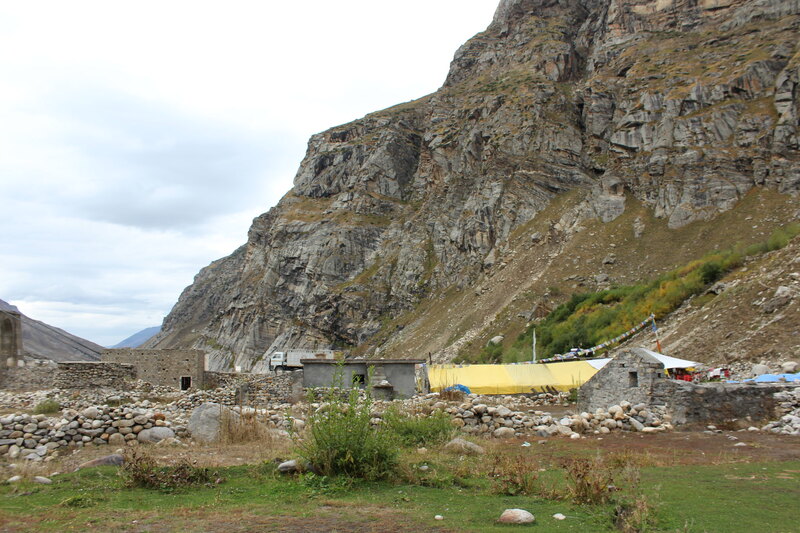 Chhatru is a small village which is situated at almost equal distance from Rohtang La and Batal. Like Chhatru, we came across many such villages in Spiti Valley - small villages housing very small population where life seemed to be almost at a standstill. Saying that would be little preposterous because I said this when I compared this with the life that I am used to living. When seen from the other side we could be seen running day and night without even knowing why are we doing that. After Chhatru, the condition of roads deteriorated so much that we could not see any road for long stretches. There were pebbles all around and few of them were arranged in a less disorderly way which was to be assumed the road. Add to that water streams emanating from a sidehill. I do not know how to describe Batal. I could not any see any village houses there. There was one small dhaba providing food and stay and there was one government guest house. Apart from that nothing else was there, save few construction workers celebrating a hard day of work with music system powered by a bulldozer. The small dhaba was run by an elderly couple who used to run that dhaba in summers. In winters, they used to move to Manali because Batal would be covered by few feet of snow. They also saved lives of many people who got stuck in heavy snowfall. For this humanitarian work, there were newspaper reports on them and they have posted those reports on the walls inside the dhaba. Called fondly as Chacha and Chachi, they were jolly in nature. Chacha used to respond 'hazaar' (a thousand) when enquired about the price of any item. We stayed in that dhaba that night, but it was too cold and difficult to sleep. There was a plan to camp near Chandratal and we thought that it was a good decision, in the end, not to go for that. Strong winds blowing in a cold weather would have frozen us. There are two ways to reach Kaza, the center of Spiti valley. One was from Manali via Rohtang La which we had chosen. The other was from Shimla. We met a contractor in Batal and out of curiosity we asked him out of the two roads to reach Kaza, which one was better. He said definitely one from Shimla because that road is better kept than the one we were traveling. The terrain that we saw from our journey Chhatru onwards was getting familiar as we moved on. There were high mountains on both sides of the valley with a steep slope. You could not see a tree or a bird flying casually. Even villages were not that frequently sighted. This was a reason why Spiti valley is called a cold desert.